The Johnson administration saw an unprecedented prevalence of poverty in the United States during the 1960’s. Coupled with the influence from the Civil Rights Movement, a spotlight had been placed on the struggles of the impoverished, and in his so-called “War on Poverty,” Johnson’s administration combatted inadequate access to medical treatment by bringing forth Community Health Centers. The vast majority of them accept funding under the Health Resources and Services Administration’s (HRSA) Health Center Program, the primary mechanism by which Federal funds are granted to CHC’s today in the U.S.
Community Health Center’s (CHC) are non-profit organizations designed to help create a healthcare safety net for the nation’s most vulnerable and underserved populations. They empower local communities by giving them significant influence in the operation of CHC’s, making it a truly community-influenced organization. As a result, funding for these facilities has increased substantially: under the Patient Protection & Affordable Care Act of 2010, funding for CHC’s was increased by a whopping $11 billion, purposed to create new centers and increase the capacity of existing centers. As with other medical facilities, CHC’s have substantial medical malpractice exposure. To address this issue, the Federally Supported Health Centers Assistance Acts of 1992 and 1995 extended Federal Tort Claims Act (FTCA) protections to CHC’s. Basically, employees of CHC’s are deemed to be Federal employees under the FTCA. As such, if a CHC employee is sued for actual or alleged medical malpractice, they are defended by the Federal government – ultimately the Department of Justice. The whole idea behind extending FTCA protection to CHC’s is to reduce their operating expenses (i.e. traditional medical malpractice liability) so that more revenue can be spent on providing healthcare related services to those in their community that need them. Activities/services that are not “deemed” or approved under the Health Center Program for any particular healthcare center. Work performed by contracted providers working less than an average of 32.50 hours per week over the term of the contract with the exception of a short list of specialties. Services provided by an individual that are outside the scope of employment (or if contracted, outside the scope of the contract). Services provided by volunteers, even in emergency situations. To cover the medical professional liability exposures not picked up by the FTCA, many CHC’s purchase what is commonly referred to as an FTCA Wrap product. 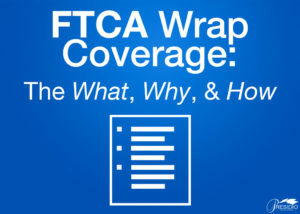 FTCA Wrap products are usually facility-driven medical professional liability policies modified via endorsement to “wrap around” the coverage provided by the FTCA and pick up anything that might otherwise fall through the cracks. Understanding the entirety of exposures not picked up by the FTCA and the nuances between the various FTCA Wrap products is necessary not only to successfully sell the product, but also to ensure it is properly placed. Historically, the larger a community health clinic operation grows, the more exposure it has in the aggregate from the things that fall through the FTCA cracks. Larger operations also have more revenue with which to buy FTCA Wrap coverage. The good news is if Federal funding for CHC’s is sustained at its current level, CHC’s in the U.S. are expected to grow in both size and number. That means an increasing number of potential purchasers of the FTCA Wrap product and a growing list of targets for retail agents focused on the healthcare industry. To find out more about available FTCA Wrap options, contact Kerri Flores at (805) 499-7300 or at kerrif@presidioinsurance.com.